Lander and rover missions, combined with exquisite satellite images have revealed much about the surface of Mars. But what about the ~3400 km of rock and metal that lies between the surface and the planet’s center? We know very little about the deep interior, yet it is the ‘engine’ that drives the planet’s evolution. In November 2018, the InSight mission landed on Mars to begin two years of detective work to look deep inside the Red Planet. Left: December 4th, 2018 image from InSight’s robotic-arm mounted Instrument Deployment Camera showing the spacecraft’s deck, with the Martian surface of Elysium Planitia in the background. In the foreground, a copper-colored hexagonal cover protects the Seismic Experiment for Interior Structure instrument (SEIS), a seismometer that will measure marsquakes. The gray dome behind SEIS is the wind and thermal shield, which will be placed over SEIS. To the left is a black cylindrical instrument, the Heat Flow and Physical Properties Probe (HP3). HP3 will drill up to 16 feet (5 meters) below the Martian surface, measuring heat released from the interior of the planet. Above the deck is InSight’s robotic arm, with the stowed grapple directly facing the camera. Credit NASA/JPL-Caltech. 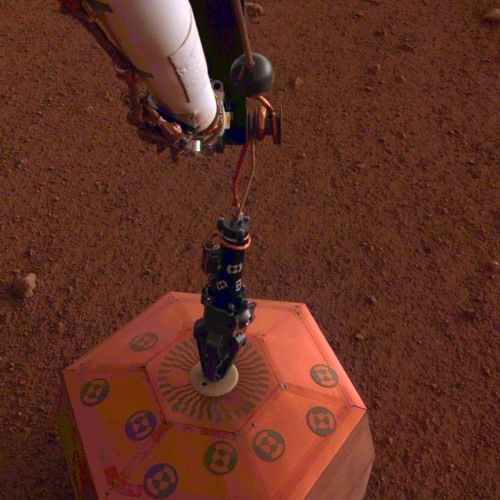 Right: SEIS deployed onto the surface of Mars on December 19th, 2018. This was the first time a spacecraft robotically placed a seismometer onto the surface of another planet. The image was taken around Martian dusk. Credit NASA/JPL-Caltech. 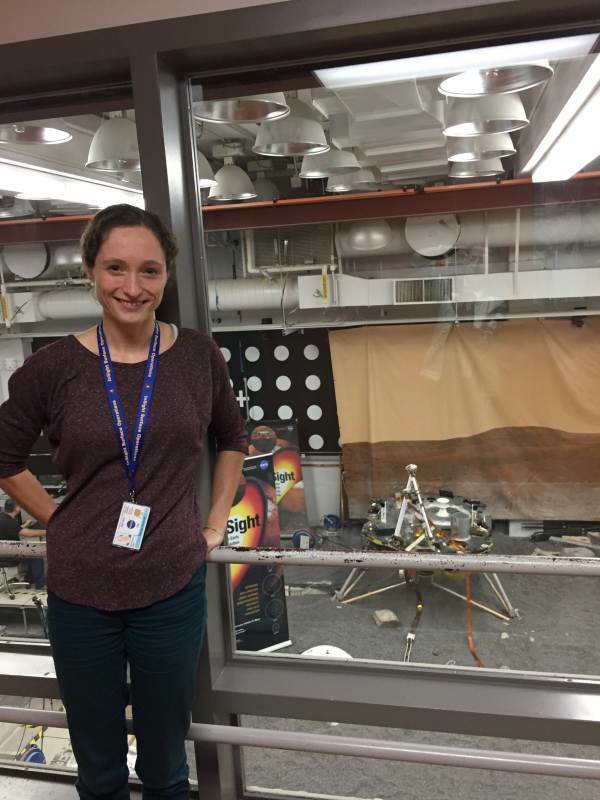 Anna Mittelholz at the Jet Propulsion Laboratory: she and Catherine Johnson spent two weeks there at the beginning of InSight operations in December 2018. Geophysicist, Dr. Catherine Johnson, has been working with PhD student Anna Mittelholz at the University of British Columbia to prepare for the InSight mission by better understanding Mars’ interior through studies of the planet’s magnetic field. InSight will measure the planet’s vital signs: listening for quakes, measuring the heat being lost from Mars, but also carefully monitoring the environment at the landing site. Part of that monitoring includes measuring magnetic fields. Magnetic fields can tell us about Mars atmosphere and its interior. Like on Earth, Mars’ upper atmosphere is ionized by solar radiation and this creates small magnetic fields that change from day to night. However, unlike Earth, Mars has no present-day global magnetic field, but satellite data indicate that rocks near the surface were magnetized in an ancient field. InSight will, for the first time, measure the magnetic field on the surface of Mars. Those measurements will tell us how strongly magnetized rocks near the landing site are, and provide the first ground “magnetic weather” measurements! The daily changes in the magnetic field can be used to probe the electrical conductivity of the rocks beneath the surface. Because electrical conductivity is very sensitive to water content, the analyses that the UBC team will do are important for understanding the amount of water that is bound up in Mars’ rocks. 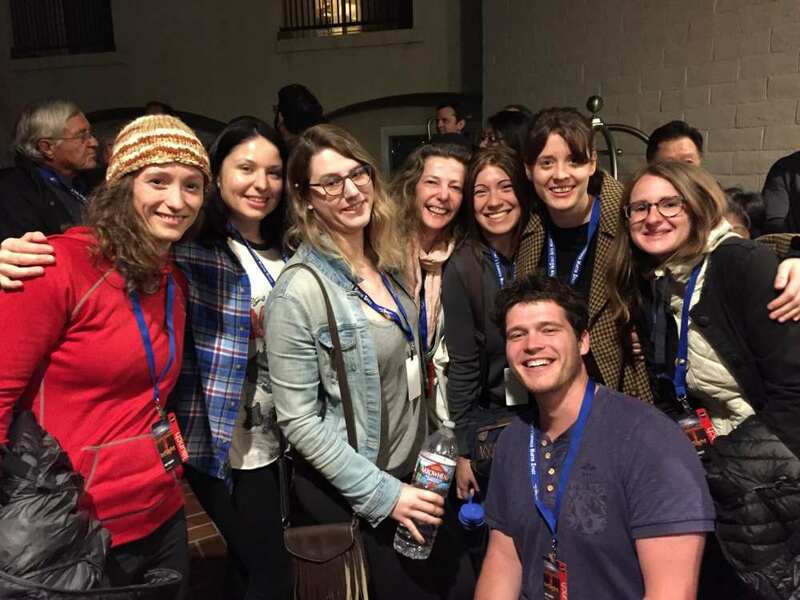 The UBC team at the InSight launch, May 5, 2018. InSight launched from Vandenberg Air Force Base, California, the first interplanetary launch to take place from the west coast. 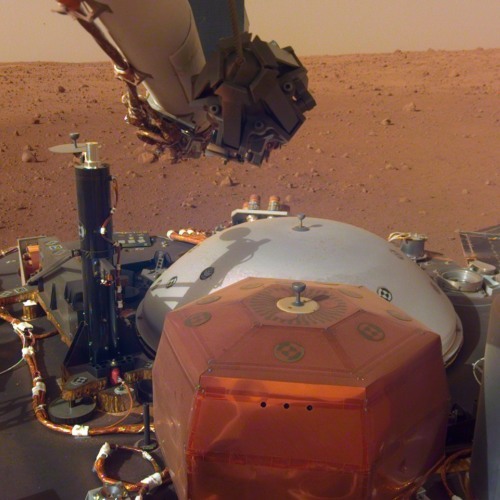 InSight is a NASA Discovery mission, run by the Jet Propulsion Laboratory, with major contributions from France, Germany, the UK, Switzerland, and Poland. This extraordinary international participation means that it offers exciting opportunities for young scientists working as part of the team. SEIS is now deployed on the surface of Mars to listen for quakes and image the planet’s interior, the weather and magnetic field sensors have been monitoring the environment since December, and HP3 will be deployed in the coming weeks. So, here’s to a shaky year on Mars!